In recognition of outstanding service to physics, and thereby exemplifying the mission statement of Sigma Pi Sigma, Steven A. Feller is hereby awarded the Sigma Pi Sigma Outstanding Service Award. Steve Feller has been teaching physics at Coe College for 38 years. During that time he has worked on the physics of glass with over 200 students. His students and he have published over 140 articles on glass and they have given hundreds of talks on the subject at meetings around the world ranging from the APS, the American Ceramic Society, International Congress on glass, the International Conferences on Borate Glasses, Crystals, and Melts, the British Society of Glass Technology and at many universities and colleges in the United States and abroad. 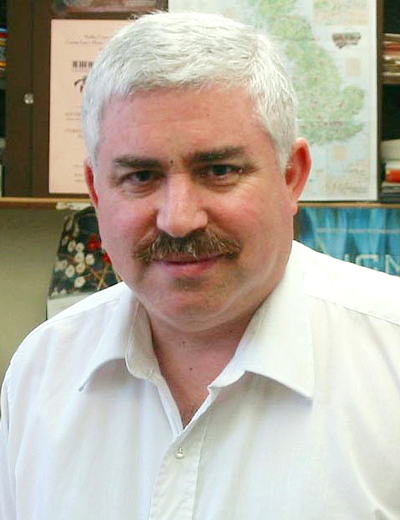 He was a Fulbright Fellow to the United Kingdom at Reading University and the Rutherford-Appleton laboratory in 1996. Also, he has been a visiting scientist at the University of Warwick (Coventry, UK), the National Hellenic Research Foundation (Athens, Greece), Sojo University (Kumamoto, Japan), Ben Gurion University of the Desert (Beersheva, Israel), Mansoura University (Mansoura, Egypt), the University of Innsbruck (Innsbruck, Austria), and others. With Prof. Adrian Wright he established the triennial International Conference on Borate Glasses, Crystals, and Melts. The ninth meeting of the series will be at Oxford in July 2017. He has a research interest in numismatics and has written dozens of articles on monies used in the various camps of World War II. He is the coauthor with his daughter Ray of the standard book Silent Witnesses: Civilian Camp Money of WWII.